In 1971 Triumph changed the wheels to be mounted via lugnuts just like a regular wheel. While they do not look as good as the knock off variety, there were advantages to these wheels. Since they were mounted the same as any other Spitfire wheel they can easily swapped with wheels of any other Spitfire. Less of a chance of you getting stranded if a wheel breaks. Also the hub adapters can wear and eventually the wheel will spin on the hub. At the minimum the axle won't turn the wheel, at worst the hub will break while driving. Imagine what happens when you loose a rear wheel at speed. 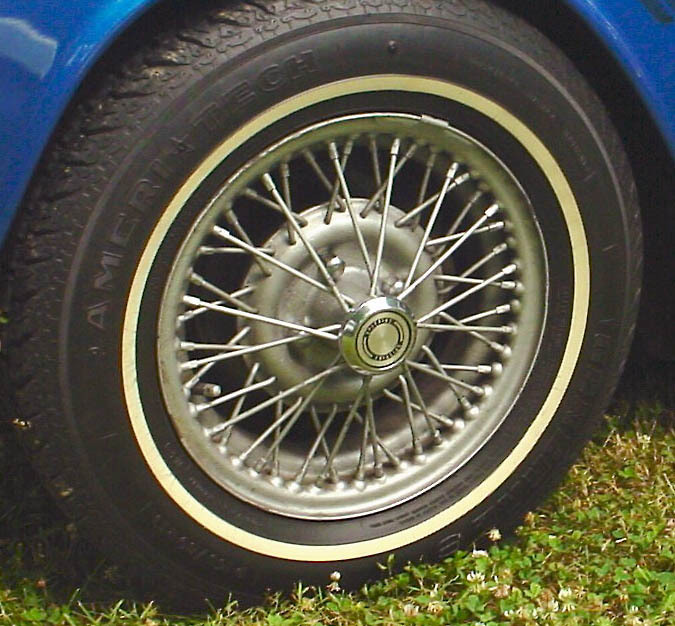 Wire wheels have always had the problem of going out of "true" (spokes becoming loose and the wheel wobbles on the car). I have been told that the lug mounted wheels stay truer longer. The biggest advantage I would see for the car you are looking at is that you would just remove the disk wheels and put the wire ones on. Quick and easy. Yet another problem with wire wheels (both varieties) is that they require inner tubes and other tube related fittings. Not something you can find at every corner Walmart automotive section. But they are beautiful. Some say worth the hassles. 1. Ask other Spit owners if they have a set to sell. a. Join a Spitfire email list and ask. c. Ebay occasionally has wheels show up. Moss has chrome for $275 each and 160 each painted plus all the hubs, lugs, knock-offs, etc. British Wire Wheel has them.